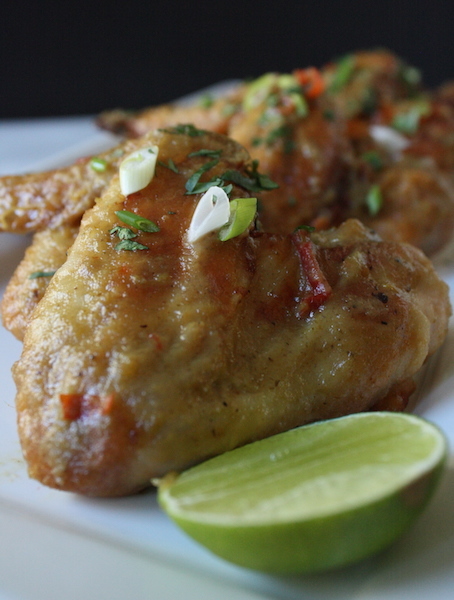 It’s Chicken Wing Friday! Time for something new though looking back on my last two chicken wing posts, they’ve been Asian of some sort. Chinese, Japanese and now Thai. Huh. It makes sense, as these are flavors that I love, and they do say to cook what you love. One of these days I’ll choose a different part of the world for inspiration but for now, this is what you get. This idea sort of came together over the last two weeks. You see, it’s been a bit crazy in Chicago with a certain sports team. Consequently, I’ve spent a lot of time in bars eating some pretty mediocre bar food and some especially forgettable chicken wings. Mediocre hot wing after mediocre hot wing, I longed for something different, something to mix it up. Then I came home from a particularly stressful game, opened my refrigerator and a tub of green curry paste with a fondness for flinging itself off the shelf with great force made its presence known. Ok, I got the message. A green curry chicken wing was in the works. 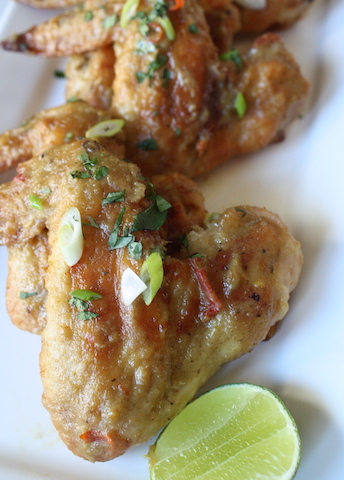 Hot wings with a Thai twist. When given the option, I usually pick a red curry. Among many wonderful restaurant dishes, it’s always my favorite with deep, rich and spicy flavors. The last few bites of rice soaked in that flavorful sauce are the very best parts of that dish. But once in a while, I’ll mix it up and order a green curry, especially if hear the curry paste is made in-house (which is relatively uncommon, most places use the same tubs of paste as you and I.) Green curry is made with green chilies rather than red and includes significantly more green herbs such as basil and cilantro. The flavor is a bit brighter than the red and predictably, more herbally. It’s a nice change. Green curry paste can be found in any Asian market and is becoming more readily available in regular grocery stores these days. To enhance the inherent freshness of green curry paste, I sauté a few red Thai chilies (red serranos work too) for both color and additional heat then add the paste and sauté until fragrant. Into the pan goes some palm sugar for sweetness (light brown sugar could be substituted), coconut milk and fish sauce. The entire mixture is then simmered until thick. The flavor is bright, sunny and just a touch spicy but not overpoweringly so, and the smell is something quite wonderful. The next winter cold I get, I’m going to put my head over a bowl of this sauce and hide under a towel. Should clear my sinuses up in no time. For the wings, I like to leave them whole. Makes for a heartier presentation though not always the neatest to eat. Stock up on paper towels. A toss in my standard flour/salt mixture to coat and into a 500°F oven to roast while the sauce is prepared. It’s all pretty easy. 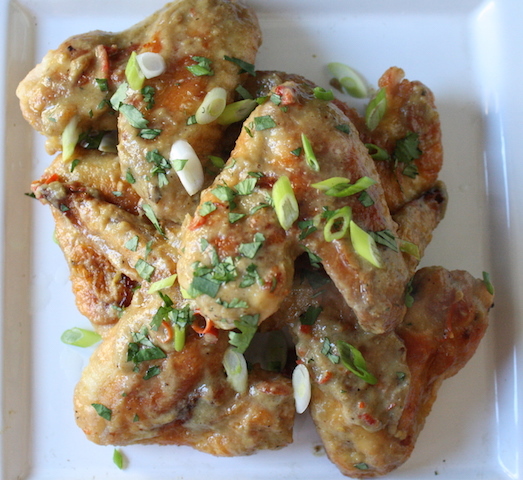 The wings come out of the oven, are given a quick toss in the sauce and a really good squirt of lime then a pinch each of sliced scallions and cilantro to garnish. Be sure to serve with a big pile of napkins; they’re a little messy. Mix it up this Football Saturday with something unexpected and delicious. STRESS THERAPY BAKING FACTOR: TOUCHDOWN! 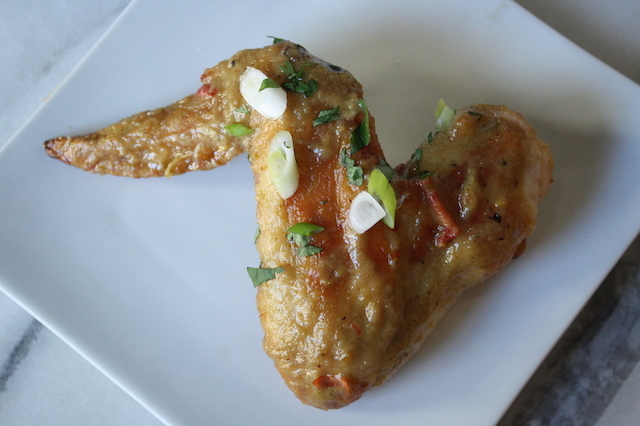 Who wants regular soggy buffalo wings week after week? Boring. Take that same idea and turn it on its head with a sauce full of bright, spicy flavors from another part of the world. Damn tasty if I do say so. For the wings: Preheat the oven to 500°F. Line a large baking sheet with foil and spray with vegetable cooking spray. Spread the chicken on the baking sheet in a single layer and spray with vegetable cooking spray. Roast the chicken for 30 -35 minutes, turning once or twice, until browned and crispy. For the sauce: in a small saucepan, sauté the chilies in a little oil for 1-2 minutes to soften. Add the curry paste and cook until fragrant, about 2-3 minutes. Add the palm sugar, coconut milk and fish sauce; bring to a boil and reduce to low. Simmer, stirring often until thick and reduced by half. Remove from heat. Transfer the sauce to a bowl, add the hot wings directly from the oven and toss to coat. 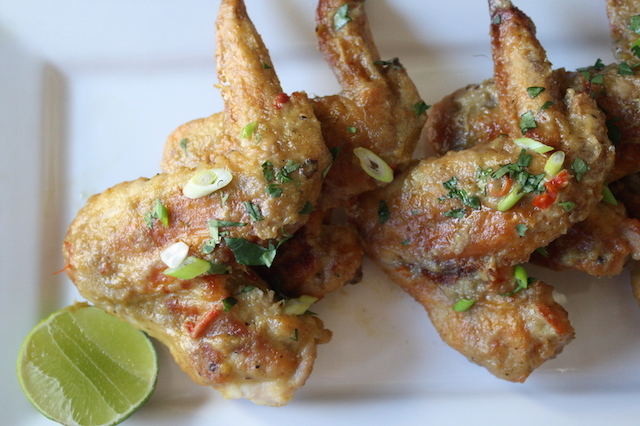 Pile onto a serving platter and top with a few good squeezes of lime juice, cilantro and scallions. Serve immediately.